In his sermon "Are You Feverish?" from 4 February 2018 at Holy Trinity Lutheran Church in Chicago, Craig Mueller refers to Thomas Moore's new book Ageless Soul: The Lifelong Journey Toward Meaning and Joy while discussing Mark 1:29-39. "Moore says that most of us think of illness as a physical breakdown that needs repair. Yet illness affects us emotionally, intellectually, and relationally. And it forces us to 'reexamine our lives, face our mortality, and sort out our values.' Spiritually speaking, we might ponder what kind of invitation lies behind each illness. And illness is something we will all face — whether our own or that of a loved one." "When Jesus raises up Simon’s mother-in-law, it is the first resurrection story in Mark. 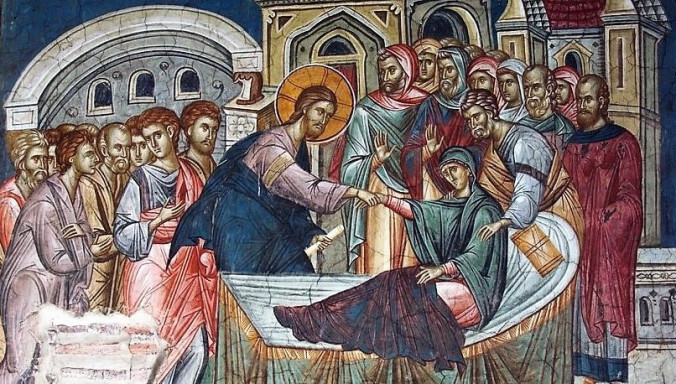 The woman rises up and begins serving. Perhaps that is our great desire also. Whether a student, whether in our working years or in retirement, we desire to have a purpose, to use our gifts and passions, and to join in God’s mission of mending the world — something Jews call tikkun olam."